I received a lot of emails last week asking how to file Domestic Violence Injunction (Requesting Restraining Order). A domestic violence injunction, or restraining order, is a court order that prohibits a person, the respondent, from doing harm to the petitioner, the person who requests the injunction. A domestic violence injunction requires the respondent to stay away from you, your vehicle, your place of employment, your school and other places you frequent. Most importantly, an injunction authorizes the police to arrest the respondent should they violate the injunction. While an injunction is one important tool to protect yourself from domestic violence you should also have a good safety plan in place. 1. Call the police and report the domestic violence incident. 2. Download and complete a Domestic Violence Intake Questionaire here or you can fill out one at the courthouse. 4. On the first floor of each courthouse, there will be an information officer to will direct you to the Domestic Violence Intake Office. The office is usually on a different floor or not readily noticeable. 5. Sign in with the receptionist at the Domestic Violence Intake Office and provide your Domestic Violence Questionaire. 6. One of the Domestic Violence paralegals will meet with you and complete your petition. 7. Your petition and initial case filings will be filed for you and forwarded to a judge. 8. You will be given the option of waiting for the Judge to review your petition or returning later. 9. 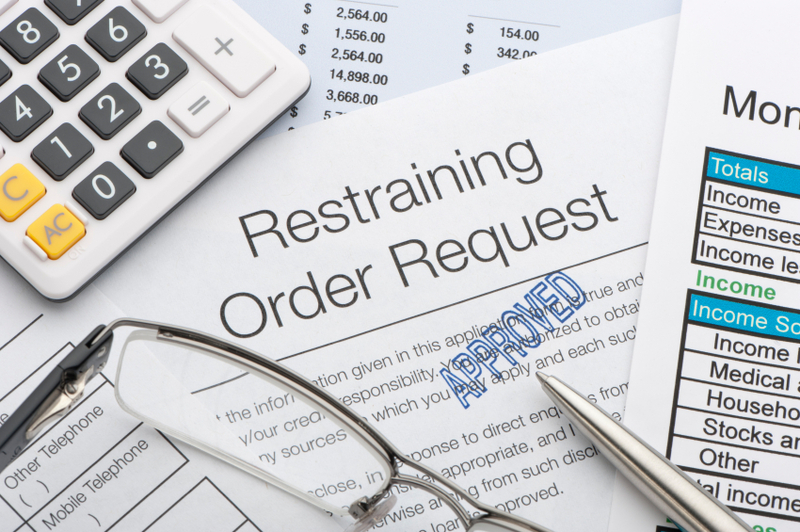 A judge will review your petition and make a determination on whether a Temporary Injunction ( Restraining Order) should be issued. 10. If a Temporary Injunction is issued, you will be given an “Emergency Packet” to provide to the police. 11. Keep a certified copy of the Injunction with you at all times. 12. The Clerk of the Court will issue a summons and the petition packet will be sent to the Sheriff for service on the Respondent (the other party). 13. You will be given a court date to return for the Final Hearing on whether a Permanent Injunction should be issued. 14. If a Temporary Injunction is not issued, you will still receive a court date to return for a Final Hearing. The domestic violence intake paralegal will provide you with instructions on what to do before the Final Hearing. You will have the option to keep your current address confidential. Injunctions can also provide for support, time sharing with children and other aspects regarding the relationship of the parties. The court provides 15 minutes for the Final Hearing. That is 15 minutes total, for both sides. Can you tell your entire story in 71/2 minutes? Most people can not. You will be expected to bring all witnesses with you as well as any evidence you may have. The FInal Hearing is an expedited hearing but it can have long-lasting consequences. Any evidence or witnesses that are improper will not be considered by the judge. This is where most people run into problems because they do not know how to properly enter evidence. Seriously consider hiring an experienced domestic violence lawyer to represent you in your case! My office receives calls each week from people who tried to represent themselves in these hearings and failed. As lawyers, we can protect your rights in a Domestic Violence case and properly present your case to a judge. In the end, keep in mind that a Domestic Violence Injunction is an order from the Court and nothing more. You should be careful in your daily activities and be aware of your surroundings. If you have or are considering filing a Petition for Protection Against Domestic Violence, or any violence or stalking, please call our office at (305) 577-4933 and discuss your case with one of our experienced domestic violence lawyers. Workshop Explores The Connection Between Domestic Violence and Animal Abuse. If you are charged with a domestic violence crime or have been served with a domestic violence injunction or restraining order, please call our office immediately to discuss your case with one of our domestic violence lawyers. Stay in the know, subscribe to our YouTube channel, “Your South Florida Lawyer, Patrick J. McGeehan,” for more videos explaining legal concepts in easy to understand terms. Eventually, you can return to our blog! ?